NB: we now try and use the hashtag #SpokesMtg for all public meetings – check it out for tweets and photos of past meetings! 10.11.16 Benefiting Business through Cycling Poster Full meeting report with associated links Tweet of meeting report. 13.6.16 Cycling and Health Poster Full meeting report including documents and presentations Tweet of meeting report. 21.3.16 Spokes Holyrood Hustings – for the 5.5.16 Holyrood election. Report of meeting. Tweet of report. Meeting notification and poster. 17.11.15 Climate, Transport & Cycling – Focused around the international Paris Climate Summit. Report of meeting. Meeting notification & poster. 15.6.15 Bike/Rail integration – speakers from Abellio/ScotRail, Sestran, Transform Scotland and Campaign for Borders Rail. On-train bike space was the biggest concern of the 100-strong audience. Website post with links to presentations and other related material. 20.11.14 Lothians Cycling Development – website posting with full links to speakers, presentations and reports. 25.3.14 Understanding Cycling – why people do and do not cycle for everyday short journeys Approx 120 people. 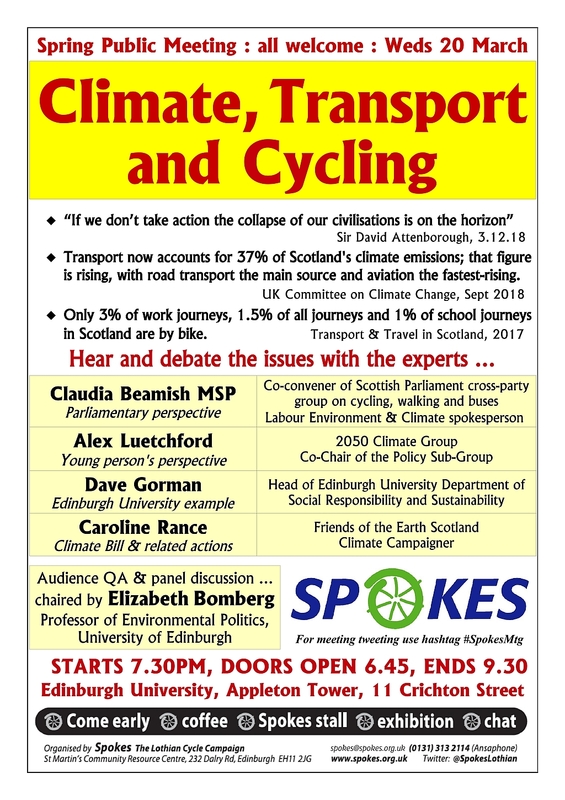 Speakers: Prof Colin Pooley [Lancaster Uni Environment Centre and leader of the Understanding Cycling & Walking study] and Cllr Andrew Burns [leader of Edinburgh City Council]. Notes on meeting [pdf 87k]. Prof Pooley slides [ppt 1.3MB]. See also our news report on the meeting. 19.11.13 Cycling Investment with Alison Johnstone MSP, John Lauder [Sustrans Scotland Director] and Sara Dorman [PoP]. Approx 100 people. Meeting report [pdf 173k]. 8.4.13 Future of Local Transport Attendance of 111 people – almost our biggest ever meeting. Meeting report [pdf 99k]. Two of the speakers provided powerpoints… Prof Iain Docherty [ppt 5.7MB]; Cllr Jim Orr [ppt 1.8MB]. See also our news report on the meeting. 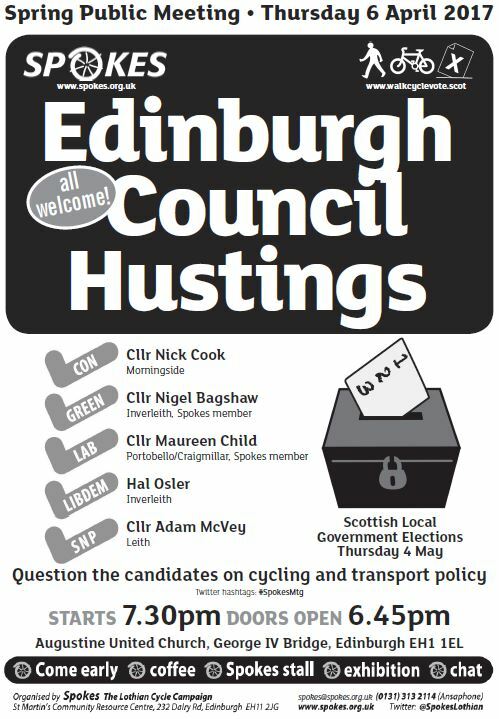 29.3.12 Council 2012 Elections, Spokes hustings – Party speakers were: Con – Councillor Cameron Rose [Spokes member]; Green – Councillor Steve Burgess [currently Green transport spokesperson]; Lab – Councillor Lesley Hinds [currently Labour transport spokesperson]; LibDem – Councillor Gordon Mackenzie [currently Edinburgh’s Transport Convener]; SNP – Councillor Alasdair Rankin. The politicians gave introductory speeches [not reported here] then spent 10 minutes in turn in each of 5 groups. We have reports from note-takers at three of the groups… Group A [pdf 51k]; Group C [pdf 49k]; Group E [pdf 47k]. The politicians then had 3 minutes each at the top table, to sum up [pdf 46k]. The meeting was also reported by Edinburgh Napier News [click its arrow for a sound report] and by The Edinburgh Reporter [use its right-hand vertical slider bar to read its live report]. 17.11.11 Cycling policies in Edinburgh and Oxford [doc 29k] Both cities are developing a largely off-road network suitable for families and the less-confident, together with more bike-friendly conditions on roads used by the everyday more confident cyclist for commuting, shopping etc. Oxford calls it their Dual Network, whilst Edinburgh‘s Active Travel Action Plan refers to the two aspects as the Family Network and the Cycle-Friendly City. 23.3.11 Holyrood Election Hustings – we used an unusual format (in a vote at the end, the audience and speakers overwhelmingly liked it). After introductory 5-minute speeches the audience was split into 5 groups of 15 or so people, with each politician spending 10 minutes in each group, ending with 2-minute closing speeches to the whole audience. Notes were taken by 5 different Spokes members, who each followed one politician – therefore the style of the notes varies. Marco Biagi, SNP [pdf 47k], Sarah Boyack MSP, Labour [pdf 63k], Cllr Steve Burgess, Green [pdf 58k], Cllr Gordon Mackenzie, LibDem [pdf 71k], Cllr Cameron Rose, Conservative [pdf 17k]. Note that party manifestos had not yet been published – we will do a website news item when they are. 25.11.10 Bike Storage at Home and at Work – meeting to move forward with Spokes bike storage project. Presentations by project organiser Katherine Ivory [ppt 1628k], TPi consultant Neil Anderson [ppt 2041k], Bike Station BWTW organiser Gary Bell [pdf 2679k], Tollcross CCF project organiser Angela Hull – actual tenement parking installations [ppt 2394k]. 23.3.10 Edinburgh City Council Cycling Action Plan – Transport Convener Cllr Gordon Mackenzie – report in Spokesworker 20.4.10. At the meeting a questionnaire was completed by 84 people. See the main points here and the full report here. 17.9.09 How can Edinburgh meet its Charter of Brussels cycling target? [special extra public meeting, with consultant Richard Armitage] Report in Spokesworker 27.10.09.